Buffy’s still stuck in her old ways, Xander’s still impressing me with his strength, and Spike’s not present enough for my satisfaction. Another issue of the comic, another month where I was hoping something dramatic would happen, only to be disappointed again. Still, I push on. Simone’s a zompire now, all freaky and purple, and she’s out to get Buffy. That mission will not be deterred by Severin or Xander or anyone else that tries to stand in her way. And she’s not just using physical tactics on her enemies. No, she’s getting into the psychological, too. After Xander tries, and fails, to stop her with a whack across the head, she starts taunting him about Dawn. She was never going to help him get his precious girlfriend well again, and at this point she doubts even he remembers what or who he was fighting so hard for in the first place. When he cannot be broken down that way, she resorts to using her physical strength against him. For a moment there it looked like Xander was going to end up being a flat Scooby as Simone tosses him over the cliff edge before focusing all her attention on the Slayer again. When I was hoping for a dramatic turn of events, I wasn’t thinking potential death for a character that is quickly becoming a favorite. Meanwhile, the rest of the group have their own battles to wage. Willow’s off trying to track down magic and she indeed has an enlightening experience because of it. She literally gives birth to a new Seed through the use of her own energy but, alas, it won’t do them any good in the short-term because the new Seed will take millennia to bring back power to the world. They don’t have that kind of time, so it’s up to Willow to figure out how to speed up that process. She has an idea, but it’s a very dangerous one. Willow wants to funnel Severin’s power into the Seed and jump-start its effect. Illyria was intriguing me in this issue because she’s bringing up more ties to her humanity, and actually acting like she cares about Severin’s welfare. She first reached out to him, warning him that he must stop his attempt of reversing time or he will rip apart the fabric of the universe. And when Willow makes mention of her plan to harness Severin’s power for good, Illyria’s the one who warned that it could likely kill him. She brings up what happened between Fred and Wesley, how he literally died for his quest. Honestly, she got me a bit teary-eyed for a moment there. I like that we are getting to see that side of her just a bit. Alas, we returned to Buffy and her less-than-interesting storyline as we ended the issue. 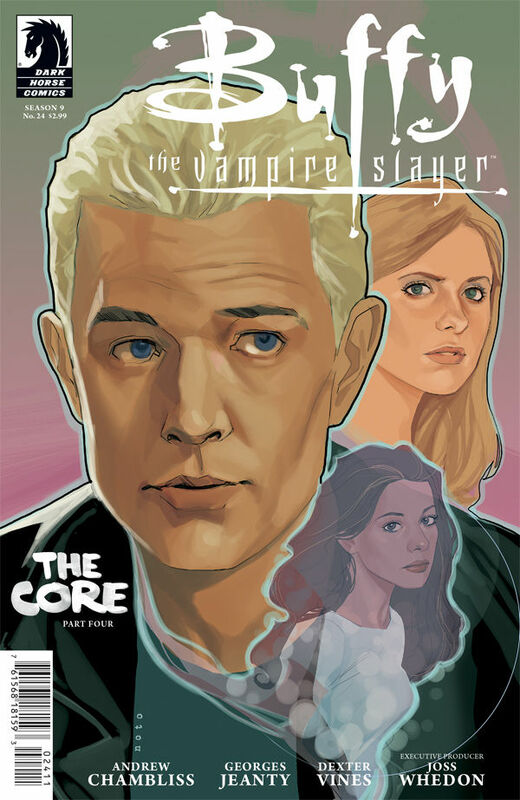 Here, I’ll summarize the entire issue between Simone and Buffy: Taunting, fighting, yelling, combat, falling, struggling, and the appearance that Simone has gained the upper hand as she hauls Buffy up at the end of the Scythe for Willow and Xander to witness. It looks like hope is lost, but you know it’s not. Until next time, I’ll be over here wishing Spike had his own comic again and he could take Giles, Xander, Dawn, and Willow along with him. Now that’s a group I could really get behind!